Eva Clayborn was born 5 April 1886 in DeKalb County, Tennessee, to William H. and Matilda Driver Clayborn. She married Sim Braswell on 30 December 1905 in DeKalb County, Tennessee. 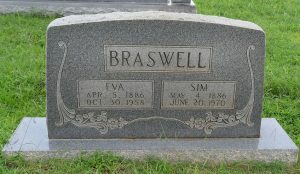 [Sim Braswell was born on 4 May 1886 in Tennessee. He and Eva were married by L.W. Beckwith, MG. ] Eva and Sim would have seven children together, all listed below. Eva died at her home 30 October 1958 near New Home, Tennessee. [Obituary of Eva Braswell, Smithville Review Newspaper, 16 November 1958 Issue.] Sim died on 20 June 1970 and both are buried in Whorton Springs Cemetery in Smithville, Tennessee. Frances Braswell married a man with last name of Flynn and lived in Chicago, Illinois, in 1978. Dorothy Joyce Braswell married a man with last name of Tendale and lived in Memphis, Tennessee, in 1978. 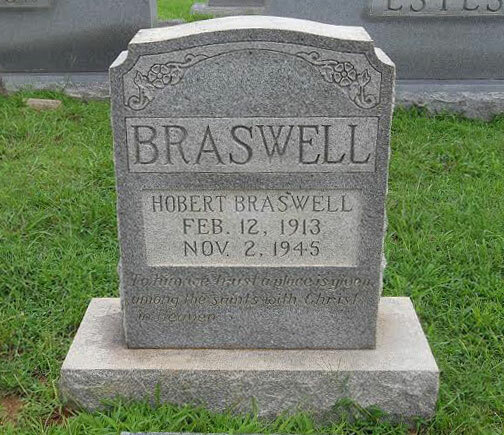 Taft Braswell was born in 1911. He married on 5 April 1929 to Mattie Johnson (born in 1910) in DeKalb County, Tennessee. The U.S. Census of 1930 lists Taft living with his parents, Sim and Eva Clayborn Braswell, and widowed, thus Maggie died less than a year after the couple was married. On 3 November 1938, Taft married Vada Arnold in DeKalb County, Tennessee. Taft and Vada are listed in the 1940 U.S. Census in the 4th District of DeKalb County, Tennessee, with a newborn daughter, Walma D. Braswell. Jimmy Griffith was born in DeKalb County, Tennessee, and died prior to 2001. Marie Lynn Griffith was born on 18 May 1964 in Smithville, DeKalb County, Tennessee. She married Garry Edward Murphy on 30 December 1979 in DeKalb County, Tennessee. She divorced and married a man with the last name of McBride. She had one child, Lynesse Danielle McBride, who lived in McMinnville, Tennessee, in 2001. Marie Lynn Griffith McBride died on 24 February 2001 at Riverpark Hospital in McMinnville, Warren County, Tennessee, and was buried at Smyrna Cemetery near McMinnville, Tennessee. Charles E. Griffith was born in DeKalb County, Tennessee. He married first to Cathy Darlene Houk on 20 January 1974 and second to Phyllis Huttleston. He lived in Alexandria, Tennessee, and served in law enforcement as a police officer in Alexandria, Tennessee, and as a detective for the DeKalb County Sheriff Department. He was elected as an alderman in Alexandria, Tennessee, where he resided in 2015. Maurice L. Griffith was born in DeKalb County, Tennessee, and married Darlene Turner on 20 November 1983 in DeKalb County, Tennessee. He lived in Smithville, Tennessee, in 2006. Clay Clinton Braswell was born on 24 October 1918 in DeKalb County, Tennessee. He married Effie Vaughn. [Effie Vaughn was born on 8 March 1918.] Clay entered the service of the United States Army on 15 August 1941 at Fort Oglethorpe, Georgia. Achieving the rank of staff sergeant, he served with the 3748th Quartermaster Truck Company. He was in the Asiatic-Pacific Theater from 6 November 1943 to 13 January 1945, and was discharged on 3 February 1945 at LaGarde General Hospital at New Orleans, Louisiana. He was awarded the Asiatic-Pacific Theater Ribbon with one bronze star, the American Defense Service Medal, and the Good Conduct Medal. [World War II Veterans of DeKalb County, Tennessee, 46.] After the war Clay settled down as a farmer and attended a Baptist church. Clay passed away 9 December 2000 at the Alvin C. York V. A. Hospital in Murfreesboro following an extended illness. [Obituary of Clay Braswell, Smithville Review Newspaper, 20 Dec 2000 Issue.] Effie followed in death on 10 February 2004. [Effie Vaughn Braswell Obituary, Smithville Review, 18 February 2004.] Both are buried at Whorton Springs Cemetery in Smithville, Tennessee. Clay Douglas Braswell was born on 21 December 1946. He married Nancy Clair Crook on 16 March 1966 in DeKalb County, Tennessee. 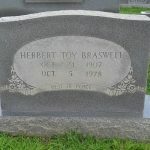 He died on 28 February 1978 and was buried at Whorton Springs Cemetery in Smithville, Tennessee. Diane Braswell married Jerry Douglas Ashford on 29 May 1970. They had two children, listed below. They lived in Smithville, Tennessee in 2015. Debbie Ashford married Mark Delaney and resided in Indiana in 2004. Jeff Ashford married Angie and had two children, Dalton Ashford and Bailey Ashford. James Calvin Braswell (“Calvin”) was born on 15 July 1924 in DeKalb County, Tennessee. He entered service of the Army of the United States on 2 July 1943 at Fort Oglethorpe, Georgia. A private, he served Battery A of the 257th Antiaircraft Artillery Battalion. Calvin was discharged on 19 August 1944 at Camp Hullen, Texas. [World War II Veterans of DeKalb County, Tennessee, 47.] After the war James married Lillian Cornelia Martin on 1 March 1945 in DeKalb County, Tennessee, and together they had three children. [Tennessee, State Marriage Index, 1780-2002, accessed 6 April 2015 via Ancestry.com.] Calvin died on 20 November 1974 at the Veteran’s Hospital in Nashville, Tennessee, and was buried in DeKalb Memorial Gardens in Smithville, Tennessee. [Calvin Braswell Obituary, Smithville Review, 28 November 1974.] Lillian died on 17 November 1988 in Nashville, Davidson County, Tennessee[iii]and was buried at DeKalb Memorial Gardens in Smithville, Tennessee. James Calvin Braswell Jr. resided in Nashville, Tennessee, in 1974. 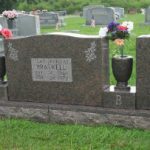 Shirley Braswell married a man with the last name of Bennett and lived in Nashville, Tennessee, in 1974. Teresa Braswell lived in Nashville, Tennessee, in 1974. 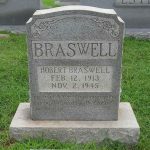 Everett Franklin Braswell (“Franklin”) was born on 14 September 1927 in DeKalb County, Tennessee. He entered the service of the Army Air Force of the United States on 2 October 1946 at Fort Oglethorpe, Georgia. A private, he served in the Indoctrination Division of the Air Training Command at San Antonio, Texas. He was discharged on 17 February 1947 in San Antonio and was awarded the World War II Victory Medal.[Ibid. at 46.] After the war Franklin worked as a nurseryman and followed the United Pentecostal Church faith. He married on 30 July 1955 to Billie Lois Anderson (born on 25 September 1937). Franklin passed away on 6 July 1974. The following is found in his obituary of 11 July 1974: “Franklin Braswell was shot three weeks ago in north Nashville and was confined at Baptist Hospital until his death Saturday. Morris Rucker, Jr., 16, is currently held in Davidson County Jail as a suspect in the incident.” [Obituary of Franklin Braswell, Smithville Review Newspaper, 11 July 1974.] 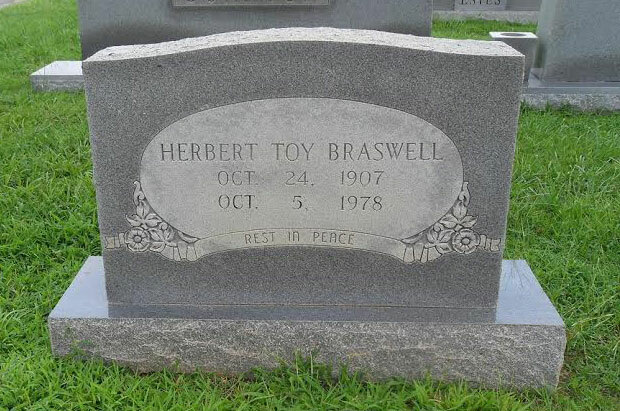 He was buried at DeKalb Memorial Gardens in Smithville, Tennessee.